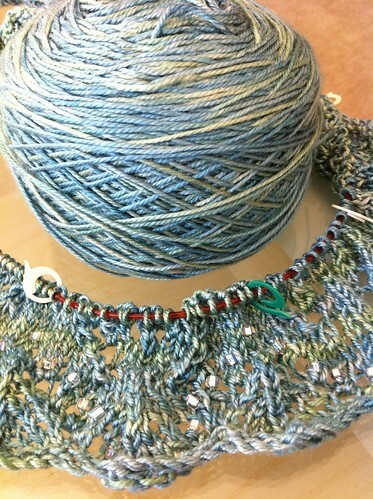 The Summer Solstice shawl has been bound off, ends woven in, and blocked. The beads are beautiful; the right amount of weight and shimmer for the edge. 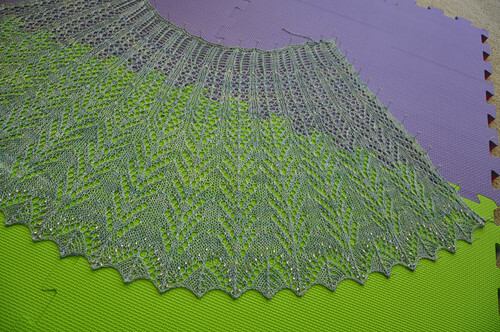 The shape of the lace and the gauge is also pleasing. Concerned about yardage, I had cast on one less repeat in width. But, with beads instead of nupps, there was plenty (20%) remaining. And, the fit is off because of it. Destined to start over, I am waiting a week before ripping out. With each passing day, I become more sure that a rip-out, re-do is the right choice. I’ve been wanting to make a jelly roll race quilt since reading about it last year. With a cousin’s baby shower coming up, and all attempts at making a crocheted blanket like the one great-nana made for me being non-starters, I thought to give it a go. I matched the jelly roll with a solid pink and set off with my strips. The top came together easily in an evening. Although, the recommendation for cutting off the first 18 inches may not have been for half-sized projects as some of my blocks ended up close to the edges. For quilting, I decided to take it on myself. I recalled the rug mug test I had done with free motion quilting and ran a larger swatch. I filed down part of my foot and plate that was getting stuck on the needle and settled in. After about 20% was complete, I stopped to see how it was going. My stitches were far from uniform, and the fabric had shifted to create bunches between stippled areas. I skinned the quilt (taking out all those quilting stitches) and started over with spray basting. This worked out better and I was able to complete the quilt without much further incident. The recipient liked the final result and I’m proud of how it came out. If you’ve been searching all over, the ruffle yarn is here. ETA: Just saw another notice about ruffle yarn, this time from my LYS. I had no idea that there was a shortage! I started over with beads instead of nupps and it’s turning out great.